As early as the first two years of his career, Zachariah was already experiencing high-dollar success on behalf of his clients, including a $4,188,137.24 judgment in McEwen v. Accelerated Commercial Consultants, a federal RICO case; and a $3,427,692 judgment in In Re the Matter of the Estate of Roslyn Schrager, a probate fraud case. Although Zach was going up against much more experienced attorneys, he refused to be intimidated and did not relent in his pursuit of justice until the case was adjudicated in favor of his clients. Zach’s success is not limited to high-profile cases. In his first solo trial, he represented a local small business in a dispute with a former customer represented by a pair of attorneys with decades of experience between them. Not only did Zach prevail on his claims against the opposing party and defeat the claims against his client, but he earned an attorney’s fee award as well—in an amount approximately fifteen times the underlying award. At his prior firm, he achieved a defense verdict in a trial involving a motor vehicle collision between a semi and a pickup truck. In a 2016 case, Zach obtained a judgment for $2.227 million on behalf of a client who had been the victim of an assault and battery. In another 2016 case, Zach obtained a judgment for $3.132 million on behalf of his clients who were the victims of fraud. The defendant appealed the decision, but the Nevada Court of Appeals agreed with Zach and affirmed the judgment. In a 2017 jury trial, Zach obtained a verdict for $28,000—seven times the total in medical bills, and then obtained almost $40,000 in attorney's fees on top of that. In 2018, Zach obtained a judgment for $1.585 million on behalf of a client who was the victim of assault and battery. In 2018, Zach obtained a settlement for $1.7 million for the victim of a defective piece of furniture. Although he cannot guarantee similar results in every case, Zach does guarantee that whether your case is worth millions or much less, if he is advocating on your behalf, you will get the same level of communication, eye for detail, and aggressive representation he provides for all his clients. Prior to co-founding Parry & Pfau, Zach was employed at larger insurance defense firm where he worked for international insurance companies and represented large corporations in personal injury lawsuits. As a defense attorney, he gained invaluable insights that enhance his efficacy as an advocate for victims who are injured as the result of others’ negligence. Now he prides himself in being a personal injury attorney in Las Vegas who takes the battle to insurance companies so his clients can focus on getting better. Whether via informal negotiations, mediation, arbitration, judgment by motion, or trial verdict, Zach’s legal acumen and professional tenacity have proven an asset his clients find invaluable. He then headed to the Midwest where he attended law school at the highly ranked University of Illinois. At the U of I, Zach received numerous awards, including two CALI Excellence for the Future Awards. He was honored to receive the law school’s most prestigious award, the Rickert Award—twice—once for excellence in trial advocacy and once for excellence in legal writing. Zach also enjoyed success in both moot court and trial team. In moot court, he placed in the top bracket in the school-wide competition and was invited to represent the college of law in the national competition. His three-member trial team took second place in the Midwestern Regional competition, which set a record as the highest-placing trial team in the school’s history. Written and spoken words are the tools of an attorney’s trade, and Zach has had focused success in both written and oral advocacy—as recognized by the honors and awards received from publications, professors, and peers. Zach is an educator himself, having accepted a position as Adjunct Professor at UNLV. He teaches substantive law in the paralegal program, including Torts, Contracts, and Nevada Practice and Procedure. He also teaches legal research and writing. 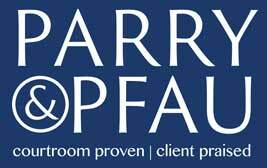 Contact Parry & Pfau and let Zach put his talents to work for you. Zach is the editor-in-chief of the Advocate magazine, a publication of the Nevada Justice Association, an organization dedicated to advocating on behalf of consumers. He also was a member of the editorial committee for the Nevada State Bar's publication, "Contract Templates for Nevada Attorneys" in 2016. When Zach takes his lawyer hat off, he enjoys coaching and playing softball (go Neff Herders! ), tinkering with graphic design, writing creatively, eating sushi, and doing just about anything with his wife, Amber, and their four kids. He is an avid escape room enthusiast, having done over fifty escape rooms in ten states (and two in Italy). Zach is into grammar (it's a blessing and a curse), a huge sci-fi fan (especially Star Wars and comic-book stuff), and an amateur typographer (and staunch proponent of only one space at the end of a sentence). Zach is also very active in his church and, when properly motivated, makes a mean fettuccine alfredo. "Mr. Zachariah B. Parry maintains a high standard in his practice of law in order to best serve the interests of his clients with experience and competence. Mr. Parry will work diligently and aggressively to receive the best possible outcome on your case. He has a tremendous attention for detail and an ability to think outside the box in order effectively assist his clients with their legal issues. As a fellow attorney, I would highly recommend retaining Mr. Parry as counsel." "Zach Parry is a top notch attorney! 5 stars was no hesitation!" "I first retained Zach Parry as my attorney in 2009. I could NOT be happier! Zach is one of the most honest and honorable men I have ever met. I will return to him with any legal matters I may ever have. I admire his integrity and would recommend his firm to people I know as well as to people I don’t know." "Zach Parry is amazing in all that he does and is the most complete attorney I have ever met." "Zach is one of the most impressive attorneys I have ever known, young and dynamic, knowledgeable and very determined. He is not afraid to fight for you and your cause and became a friend over the years. I admire his strong straightforward personality and honestness." "As a child psychologist and an expert witness in family court for custody cases, I am familiar with many lawyers in town. I had the opportunity to interview over a dozen lawyers to find someone who could assist me with my own business needs, and someone who possessed an excellent grasp of my role as an expert witness in family court. If you are looking for an honest and caring lawyer (which is a rare thing), look no further; Zach Parry is the lawyer you not only need, but want." "After extensive research, I retained Zach Parry to resolve a securities fraud case filed with the largest securities dispute resolution forum in the United States. "Zach came to the rescue; I was very pleased how quickly he got up to speed on my case. His case filings were excellent in representing my case and the respondents realized the best strategy was to settle the case. Through his strong negotiating, Mr. Parry received the highest settlement I could have expected to receive. During the process he was easy to work with always seeking my input and educating me on my options. I highly recommend Zach Parry; he is a multi-skilled attorney as he so well demonstrated on my case." "I worked with Zach for several years. He is without question the smartest and most capable attorney I’ve worked with on either side of the table. He is also the most scrupulously ethical attorney I’ve worked with. If I had to hire an attorney for myself, Zach would be the first person I’d call." "What takes years to learn for so many attorneys simply seems to be intuitive to Zach. I cannot give sufficient praise or a high enough recommendation for this individual of excellence. And, what is even more delightful, he is funny at the same time. He’s thoroughly enjoyable person with whom I am grateful to have been acquainted." "The great thing about you, I can't necessarily say this about myself, but you are a very detailed Lawyer. This is a great trait for a lawyer to have. You have definitely shown me some great things about litigation in the handling of this case." "Zach quite honestly is one of the most intelligent, hard working, efficient, and talented attorneys I have met. He is passionate about serving his clients, and is the single best writer I know." If you like hearing from our satisfied clients, take a look at what the opposing parties are saying (hint: it's not quite so nice).